5 minutes from the terminal. Situated at the corner of JR Borja and Aguinaldo Sts. practically one of Cagayan de Oro's busiest commercial disctricts. 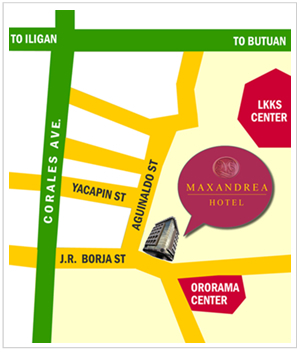 Maxandrea Hotel provides guest maximum accessibility to the city's prime business centers, malls, government offices and educational institutions. This makes travelling around the city hassle-free.